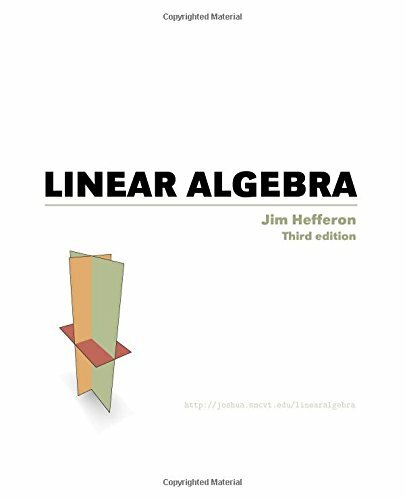 Professor Jim Hefferon of Saint Michaels's College has made available his undergraduate textbook Linear Algebra. The text covers linear systems and Gauss' method, vector spaces, linear maps and matrices, determinants, and eigenvectors and eigenvalues. Each chapter has three or four discussions of additional topics and applications. This is a textbook for a one-semester course in linear algebra and vector spaces. An emphasis is made on the coordinate free analysis. The course mimics in some ways a modern algebra course. Calculus is a prerequisite for the course. The text covers basic ideas and techniques of Linear Algebra that are applicable in many subjects including the physical and chemical sciences, and statistics. These notes were originally written for a course at the University of Glasgow. These notes are drawn from lectures given for a first year introduction to linear algebra. The prerequisites for this course are arithmetic and elementary algebra, and some comfort and facility with proofs, particularly using mathematical induction.